As urban development has become an increasing problem, urban planning is required to integrate social and economical needs with the sustainable use of natural resources. Lately planners have been using GIS techniques, based on international and local databases, in finding the most probable scenarios and the best available solutions. Four models of natural resources conservation have proved effective in the influence areas of cities: protected areas, yellow-green belts, regional parks, and oxygen generating surfaces. The establishment and management of these can be better realised by GIS techniques, because of their efficiency and ease of use, and the suitability and general availability of data. Natural capital is defined by (Costanza et al., 1997) as a physical form of the capital stock consisting of all environmental components (lithosphere, atmosphere, hydrosphere, and biosphere) and their interactions materialized in natural ecosystems that represent the basis for human welfare. In other approaches, natural capital includes three components: the actual land, our natural resources – the physical amounts of renewable and non-renewable resources, as well as ecosystems sustaining life and providing goods and services to the population (Olewiler, 2006). Natural resources can be divided according to their usage in two main categories (Figure 1). Renewable resources, are either unconditionally renewable (in the case of abiotic resources flows: solar energy, wind, geothermal energy etc.) or conditioned by a certain period of renewing time and an adequate degree of exploitation (the main cycles of elements, vegetation, fauna, ecosystems, soils). Minerals (metallic and non-metallic) and fossil fuels (oil, coal, natural gas) are among the non-renewable resources. Ecosystems are being continually aggressed by urbanization, which affects in the same time habitat structure and quality, as well as processes that control its functionality (Alberti, 2008). De facto, cities are considered by ecologist to be heterotrophic ecosystem (Odum, 1971), strongly dependent on external inputs of energy and materials, and requiring spaces which will absorb their emissions and wastes. Urban ecosystems (Duvigneaud, 1974) modify their periphery land uses and concentrate, on limited territory, human communities with different cultural levels and with a spatially variable demographical and ethnical structure. The area of influence or sphere of influence is referring to the territory polarized by an urban centre on the basis of a set or category of relations (economical, cultural and/or commercial relations, population mobility and/or environmental externalities) (Pumain & Saint-Julien, 1997). The specific area of influence of a city varies accordingly with the importance of the urban centre and the relations taken into account. 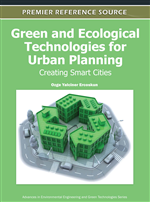 This chapter focuses on the influence areas of cities determined from an environmental and economical point of view, as these areas handle the immediate inputs and externalities related to the urban cores. Urban landscapes are characterised by a high spatial and temporal heterogeneity, consisting of a mosaic of patches with different roles and structures, determined by natural favourability and restrictiveness, but also by social elements (Newman & Thornley, 1996). There are various models of how cities develop which assess social and economic impacts, but few evaluating the impacts on the preservation of ecosystems and natural resources (Williams, McDonnell, & Seager, 2005). Most of the urban development models concentrate on sprawl as a specific form of urban development with low-density, dispersed, auto-dependent and environmentally and socially-impacting characteristics (Hasse & Lathrop, 2003). Four main modalities of natural resources conservation and management in the influence areas of cities have proved effective: urban and periphery oxygen generating surfaces, green-yellow belts, regional activities parks and natural protected areas. The objectives of this study are: (a) assessing the importance of natural resources encountered in the influence areas of towns, and the factors affecting their balance; (b) identifying the main instruments used in the sustainable management of natural resources in influence areas (oxygen generating surfaces, yellow-green belts, natural protected areas and regional activities parks) and (c) presenting solutions for an integrated management of natural resources in the influence areas of cities.